We’ve known for some time that the number of Americans who say they have no religion has been growing. But while this group does not identify with a specific religious tradition or denomination, the “nones” are not uniformly against religion having a role in society, a new Pew Research Center survey finds. We asked all respondents whether religion is gaining or losing influence in American life, and 72% of U.S. adults (including 70% of the religiously unaffiliated) said religion is losing influence. 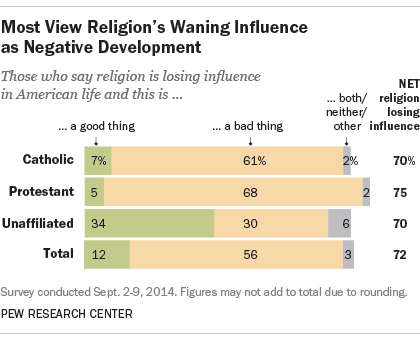 We then asked whether this is a good thing or a bad thing, and, not surprisingly, “nones” were much more likely than other major religious groups to say that the declining influence of religion in American life is a good thing. The results, however, were not completely one-sided. In fact, religiously unaffiliated people who perceive religion’s influence as declining were split on whether this is a good thing or a bad thing. About a third of “nones” overall (34%) said it is good that religion is losing influence, while a similar share (30%) said this is bad. “Nones” include atheists and agnostics as well as people who have no religion in particular. Among only atheists and agnostics, half (50%) see religion’s influence as declining and see this as a good thing, while only 12% say it’s a bad thing. But among those who say their religion is “nothing in particular,” 37% say religion’s declining influence is a bad thing and 27% say it’s a good thing. On other questions, too, sizable minorities of religiously unaffiliated people expressed sentiments supportive of religion in public life and politics. For instance, about three-in-ten “nones” (29%) said it is important for members of Congress to have strong religious beliefs. And a similar share (32%) said churches should express their views on social and political questions. While it’s difficult to pin down the reasons behind these opinions, they reaffirm the notion that not all religiously unaffiliated people are hostile toward or opposed to religion. In fact, we found in 2012 that 14% of “nones” said religion is very important in their lives, and another 19% said it is somewhat important. About two-thirds of the unaffiliated (68%) believe in God – 30% said they’re “absolutely certain” about God’s existence – and 21% reported praying daily. Only one-in-ten people whose religion is “nothing in particular” said they are looking for a religion that is right for them, but there appears to be a significant subset of Americans who are comfortable with religion having a role in their life even without having an official religious affiliation.